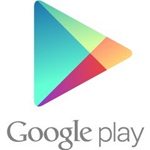 After giving us a sneak peek back at I/O in May, Google has finally rolled out the new version of web Play Store. The new UI looks totally killer, but there's a big shakeup in the features to go along with that new interface, and not all of it is good news. After the Maps update fiasco, it's starting to look like Google is pulling features it doesn't feel are being used by enough people. In the case of the new web-based Play Store, that looks like a lot of stuff. Let's go over what's new and what's gone. The new design is striking. It looks more like Android, but still feels at home on a larger screen. There are cards everywhere and the design is much cleaner overall. There are fewer tabs to cycle through, and lists are less scattered. Most of the things you'll care about are right in the middle. 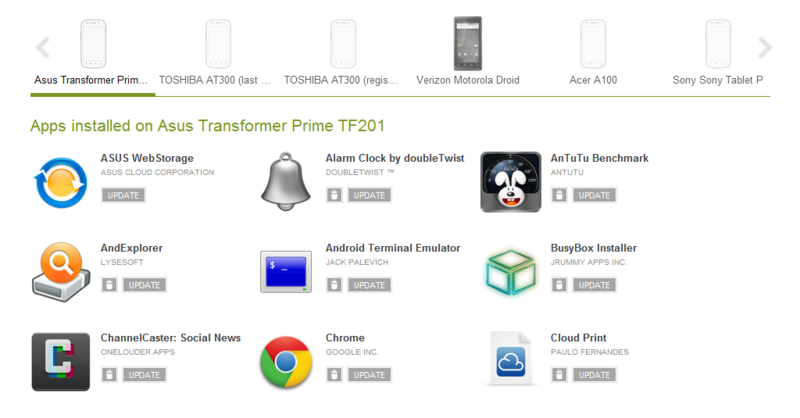 The new home tab has various editor's picks and recommendations. There are also top charts and new release tabs. This is a bit less information-dense than the old UI, but it's probably better for discoverability. By simplifying the UI, it looks like Google might have ditched a lot of features we've all come to rely on. Is that worth having a prettier Play Store? In the last version of the Play Store, we had a handy My Apps page that broke down your apps by device. You could see what needed updating, and push it down to the device from the web. There were also remote uninstalls (a great feature). All of that is gone now, and that makes me sad. 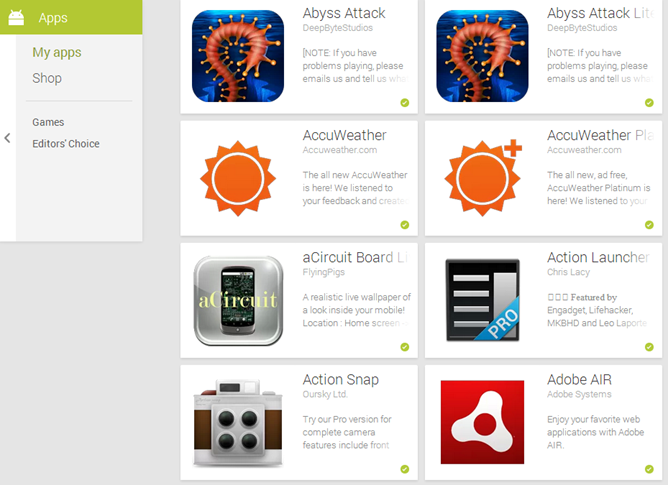 The My Apps page is now a single, giant scrolling list of all your apps. If you download all the things (and if you're reading this, you probably do) this feature is almost completely useless now. The page takes much longer to load if you have a ton of apps, and scrolling is sluggish. 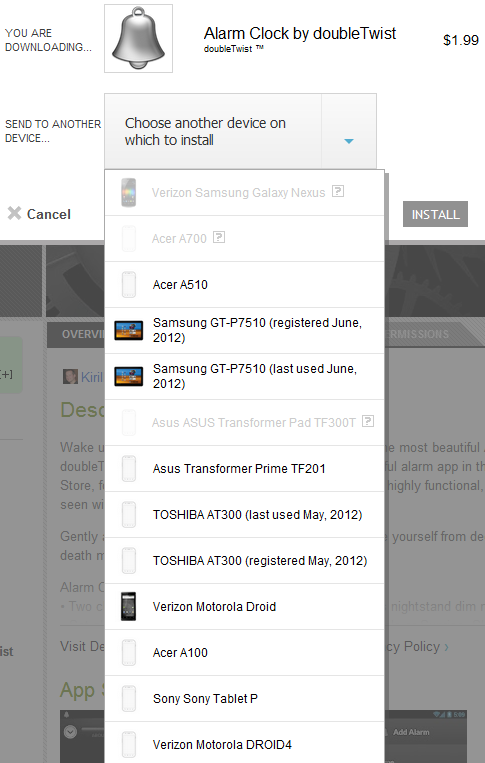 There's no option to see what's installed on each of your devices, and no update/uninstall options. Check out the old version below. Some of these features were actually fairly new, so it's odd Google would just kill them off. I can understand removing something if no one was using it, but removing the device-specific lists seems foolish. It makes the page a mess. Yes, the wishlist is no longer restricted to devices. You can view and edit the wishlist through the web store. 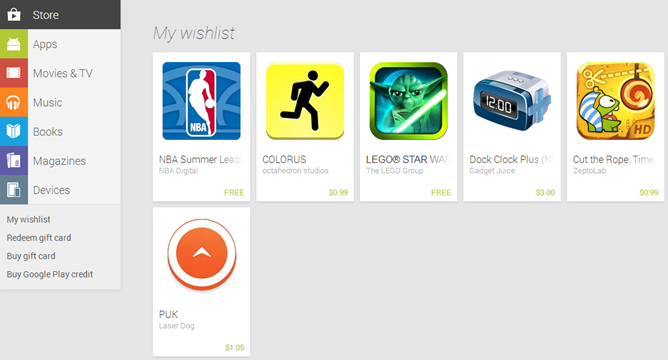 Every app listing has a wishlist button that can be used to add or remove an app from the list. Accessing the wishlist is a bit strange. The link is in the sidebar, but only on the main Play Store page. I don't know why it isn't always visible in that floating sidebar, but that's how Google is doing it. This is just a list, though. You can't bulk remove content from it. It only links you to the apps, which you then remove with the button. So it would be a good idea to not overload your wishlist. The first thing you'll notice is that app listings are great looking now. The icon is larger, and it's toward the middle next to the install and wishlist buttons. 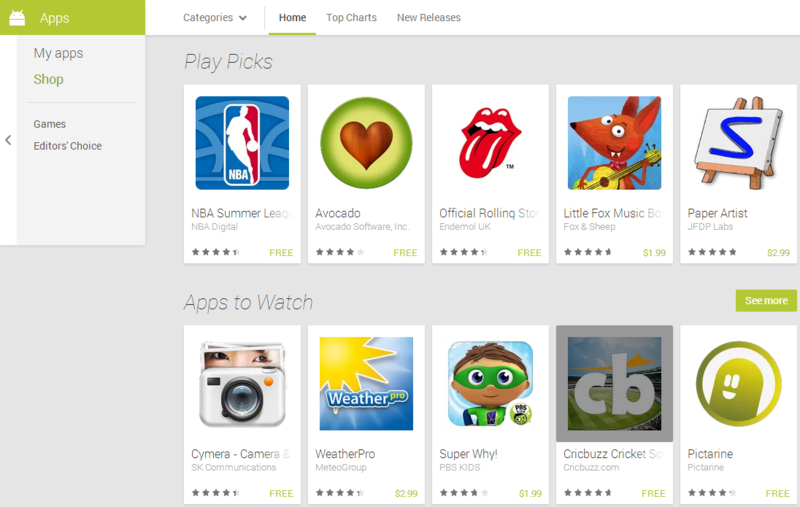 Additionally, the big feature image from the top of the old UI is no longer on the Play Store page at all. Why? No clue. 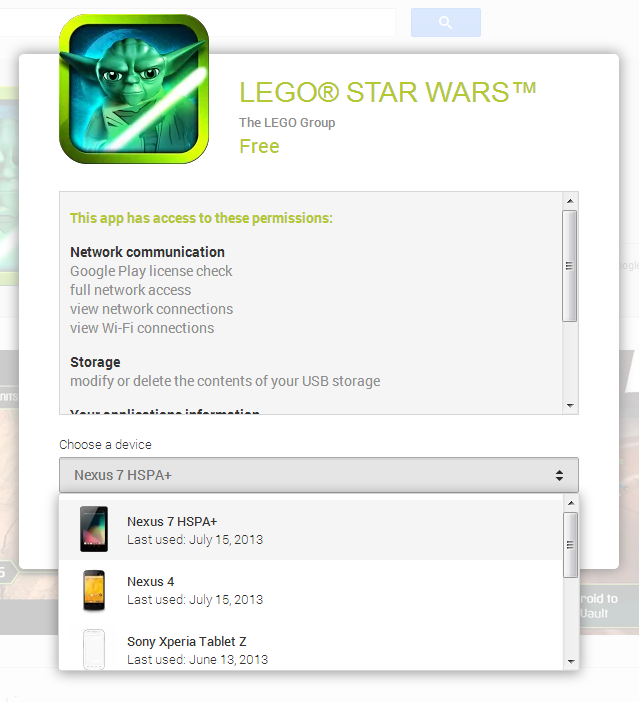 Permissions used to have their own tab in the Play Store, but that's gone now. The only way to see the permissions an app requests it to hit the Install button. You don't have to actually install, but that popup has the permission list. When you do install apps, the new UI shows the last used date for every device, which the old one didn't. See below for comparison. 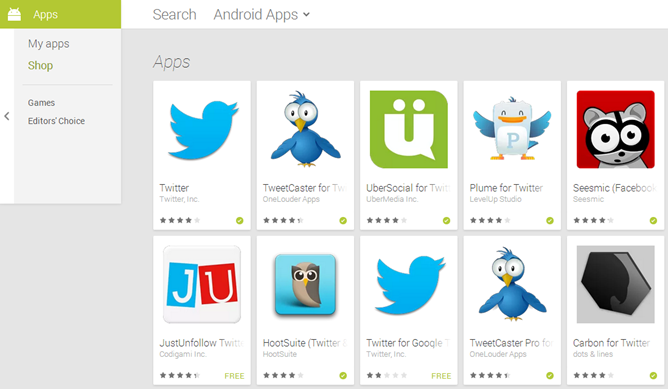 The lists of similar apps, and those from the same developer are now scrollable lists. That's better for discovery, and the style jives with the new interface. This is a good change – it puts more information in front of you rather than less. The 30-day installation graph is missing, though. That's totally bizarre. It took up almost no space and was extremely useful. The screenshots are bigger and contained in a slick AJAX-based scrollable list. If you click on one or start scrolling, the image viewer expands to fill the available browser space. If you change the size of your window, the size of the blown up shot changes to match it. That's kind of neat. One drawback to the new screenshot viewer is that the escape key no longer exits full screen mode. Now you have to home in on the button in the upper right. Keyboard shortcuts for navigating images left and right don't work anymore either and force you to use the mouse, which is quite counter-productive for those of us used to arrow keys. The images are no longer PNGs with this update. Google has transitioned all Play Store images to the WebP format, which should load faster. If your browser doesn't support WebP, the Play Store falls back to PNG, but images will take about 10x longer to load. Again, we've got a whole post on this WebP and overall AJAX situation, so check that out for all the details. The previous version of the Play Store had sorting and filtering options for user reviews, but that appears to be gone now. You cannot choose to only see reviews from a certain device, star rating, latest version, or any other criteria. This is especially annoying if you're trying to find other users with your device to see if they might be seeing the same bug you are. You can only see two reviews next to the score breakdown chart. 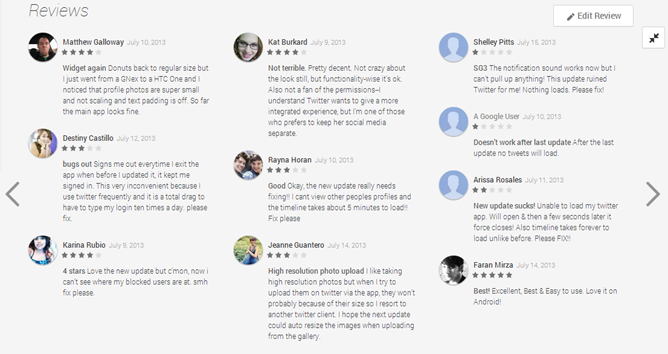 Click the arrow to scroll over, and the reviews do the same window filling trick from the screenshots. The current list seems to be in reverse chronological order. You can click through the reviews one seemingly random batch at a time. The old version was paginated with 10 pages, which was probably more usable. When you perform a search from the top bar, the results are displayed in a nice-looking page of cards. However, there is no pagination at all. You scroll down and when you hit the 48th result, it just stops in the middle of a line. There is no arrow to go on to the next page, no infinite scroll – it's just done. These are all the search results you get. Better luck next time, apparently. As with the reviews, all the filtering options are gone here too. You used to be able to sort by popularity or relevance, for example. There was also a drop down where you could limit your search to paid or free apps. It's very weird Google would take this functionality out, especially if we're going to be limited to 48 results. There are a few other small changes we've noticed in the Play Store, including the language selector. This used to be down at the bottom and translated the UI, reviews, and description (if available). That's going to be a pain point for folks that need to see things in a different language. Additionally, before this rollout the old market.android.com URLs would redirect, but now they just 404. All these changes, and we still didn't see new features people have been asking for. Where are paid app filters? In-app purchase menus? App gifting? Nope. None of that. It looks like the revamped Play Store is rocking a slightly tweaked version of Roboto, though. It seems to have fewer glyphs than the "proper" Roboto versions, but we're going to go into detail on that in a separate post. The new Google Play web interface is much more attractive, but a lot of features were pruned in the process of redesigning it. It's unclear if any of these will be coming back, but this may very well be the way things are going to work from now on.